Age catches up with dogs just as it does with people. As your best pal gets older, you might notice him having difficulty getting up from a prone position, or climbing up the stairs or into your car. 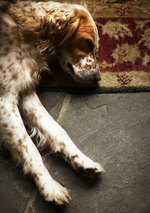 If your veterinarian diagnoses arthritis as the culprit, she can prescribe Dasuquin to help ease the dog's discomfort and put some spring back into his step. This prescription-only medication has few, if any, side effects. Manufactured by Nutramax Laboratories, Dasuquin contains the glucosamine-and-chondroitin-sulfate-based joint supplement Cosequin along with avocado soybean unsaponifiables, which improve canine joint health and are well tolerated by most dogs. Some dogs might experience gastric upset from the ASU. If that's the case, Cosequin is the better joint supplement choice. Dasuquin is not contraindicated for any other medication or supplement you might give your dog, according to Nutramax Laboratories.